The poster doesn't indicate how many stations were in each class. It did indicate that overall, the 410 weather stations (out of 1218) were "well-distributed", but it doesn't give any other information about the distribution. The United States temperature trends estimated from the relatively few stations in the classes with minimal artificial impact are found to be collectively about 2/3 as large as US trends estimated in the classes with greater expected artificial impact. The trend differences are largest for minimum temperatures and are statistically significant even at the regional scale and across different types of instrumentation and degrees of urbanization. The homogeneity adjustments applied by the National Centers for Environmental Information (formerly the National Climatic Data Center) greatly reduce those differences but produce trends that are more consistent with the stations with greater expected artificial impact. Trend differences are not found during the 1999-2008 sub-period of relatively stable temperatures, suggesting that the observed differences are caused by a physical mechanism that is directly or indirectly caused by changing temperatures. The poster has the following chart, which I've annotated to show the years of divergence. As always, click to enlarge. All three series were aligned to the same point at the start. They are all expressed as anomalies from the same zero point in 1979. There was no attempt to plot them from an averaged baseline, such as a mean of 1979-2008 for each. Although that won't affect the trend of any of them, it does make a difference to how they appear relative to each other. The largest difference between "Class 1\2 (Compliant" and "Official Adjusted NOAA" is in 2002, which I measured to be 0.035 °C. There is little difference between the three data groups for the first decade or so, up until around 1992. There is an extended period for which the group the "Class 1-2 Compliant" dropped below the other two groups. This lasted from 1992 to 2008, with the difference declining in the last couple of years of the period. The description of the three groups are value-laden, with words such as the redundant use of "Compliant" and "Non Compliant"; and the words "Official, Adjusted" when referring to the NOAA record, this latter having special meaning for WUWT conspiracy theorists. It is well established that heat sinks have an effect on temperature offset. But, we contend the effect manifests itself into temperature trends, as well, in contradiction to the conclusions of Menne et al. (2009, 2010). The overall warming effect of a heat sink on a nearby sensor is greater at the end of a warming phase than at the start of it. Therefore, the trend will be spuriously exaggerated by warming over the 30-year study period (Figure 4). Conversely, the effect of a heat sink is less at the end than at the beginning of an overall cooling phase. Therefore, the cooling phase is exaggerated in the reverse manner as during a warming phase. This explains why warming is exaggerated from 1979 - 2008 and from 1979 - 1998, when overall warming was reported. Likewise, It also explains why the cooling from 1999 - 2008 is exaggerated. We contend that heat sinks will amplify the trends. Furthermore, if there is no trend in either direction (as during the last decade-plus), there will be no divergence. This explains why there has been no overall divergence between USHCN and CRN since CRN was not activated until 2005, and the CONUS Tmean trend has been flat. If you look at the chart (which apart from some regional trends on maps, is all the data there is at present), it doesn't appear to support the hypothesis. The authors didn't describe the physical mechanism that would explain why an established heat sink would store heat at a rate greater than the temperature increase of the surrounding area over years and decades. It's expected there would be differences in absolute temperature as a result of artificial structures, and in diurnal variation (maxima and minima), depending on the proximity of buildings and asphalt etc. A difference in the annual trend would be expected if the nearby buildings are changed over time, as happens when towns are rapidly growing. 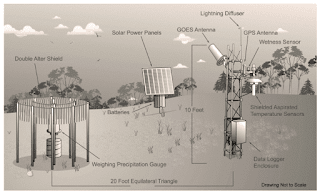 When there is a structure close to a weather station it will affect the temperature. The structure will absorb heat during the day and release it at night and that will moderate the air temperature, for example, it can raise the minimum. Structures can also affect air flow and wind. So the temperature (and humidity) recorded will be different to what it would have been had a weather station been sited further from buildings. ...warming is exaggerated from 1979 - 2008 and from 1979 - 1998, when overall warming was reported. Likewise, It also explains why the cooling from 1999 - 2008 is exaggerated. We contend that heat sinks will amplify the trends. Problem is that the period from 1999 to 2008 doesn't appear to show any consistent difference between the categories from beginning to end. The difference between 1979 and 1998 began in 2002. It wasn't a gradual dispersion. It was more like a marked shift. If the hypotheses held, then the temperatures would have diverged when the temperature was rising. Instead, the temperatures began to diverge in 1993 when temperatures dipped, and stayed diverged over the warmer period from 1992 to around 2006, when they began to converge again. I'm not disputing the authors when they claimed statistical significance for the overall difference between their "Classes 1\2" and "Classes 3\4\5". But the paper goes beyond that and talks about this cooling and heating effect, which as far as I can tell isn't supported by any analysis. This work is a continuation of the surface stations project started in 2007, our first publication, Fall et al. in 2010, and our early draft paper in 2012. Putting out that draft paper in 2012 provided us with valuable feedback from critics, and we’ve incorporated that into the effort. Even input from openly hostile professional people, such as Victor Venema, have been highly useful, and I thank him for it. Heat sinking, temperatures rising in the US of A - this article was specifically to allow continued discussion by Evan Jones of the US surface station analysis. 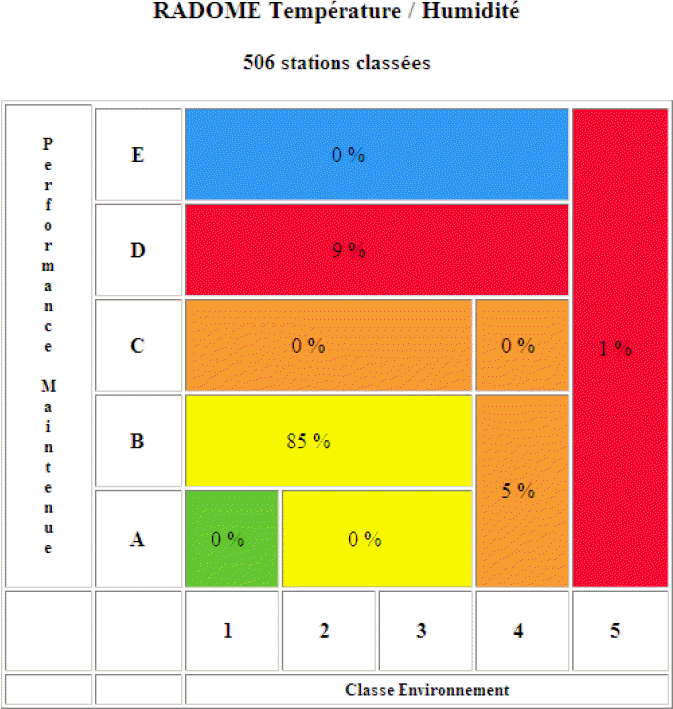 Still only around 80 stations in Watts' "Class 1\2": Only about 82 weather stations, or one in five of the 410 stations in the WUWT research are included as "Class 1\2" (link) Update: In a late comment at WUWT, Evan Jones has said there were 92 "Class 1\2" and 318 "Class 3\4\5" - a bit more than his April 2014 estimate (link) - Sou 9:56 pm AEDT 18 Dec 15). No indication of geographic spread: I couldn't find any comment from Evan that indicated how well those 80 or so weather stations were dispersed across the contiguous USA. Evan saw what he wanted to see in regard to the difference in warming, writing "It was the '90s that saw a strong warming trend. That's when your difference pop out. If you know what to look for, it sticks out of the data a mile." On that last point, here again is the chart on which I've marked the 1990's for which Evan maintains the trends are different. Also marked is the period from 1999 to 2008, when the poster maintains the "the cooling from 1999 - 2008 is exaggerated". Neither is the case. The difference in annual temperature anomaly began around 1992 (with cooler temperatures) and continued to the end of the 1990s, being much the same difference from the mid 1990s to the late 1990s. As for the "cooling trend" being exaggerated, in fact the difference in the anomalies in 1998, 2006 and 2007 (and 2008) was less than the difference in the some of anomalies in the middle of that period [amended - Sou]. What conclusions would you draw? I can't draw any conclusions without more data. I would have some questions, however. What would the data have shown if they had grouped the classifications in the manner that Leroy (2010) grouped them, with Classes 1-3 together and Classes 4 and 5 separately? What difference would it have made if they'd been able to use all the criteria in Leroy to classify the weather stations? How many weather stations are included in Watts' Class 1\2? How representative are the Watts Class 1\2 weather stations? Are they spread across the USA in the same proportion as Watts' "Class 3\4\5" weather stations? What is the basis for the claim that "the cooling from 1999 - 2008 is exaggerated", which isn't what the chart shows? In relation to the statement "warming is exaggerated from 1979 - 2008 and from 1979 - 1998", were any other possible reasons explored to explain the step drop in Watts' "Class 1\2" observed in the early 1990s? By what physical mechanism would "warming effect of a heat sink on a nearby sensor (be) greater at the end of a warming phase than at the start of it" and the effect of a heat sink be "less at the end than at the beginning of an overall cooling phase". What data is there that would support those hypotheses? What happened to the data for 1988? The data point appears to be missing from the chart. For the sake of completeness, I Googled and found the document Anthony referenced as Leroy (2010) (he neglected to provide a link). It is a paper submitted to the JMA/WMO Workshop on Quality Management in Surface, Climate and Upper-air Observations in RA II (Asia) held in Tokyo, Japan on 27-30 July 2010. The paper was submitted by Michael Leroy of Meteo-France and is called "Siting Classification for Surface Observing Stations on Land". A site as a whole has no single classification number. Each parameter being measured at a site has its own class, and is sometimes different from others. If a global classification of a site is required, the maximum value of the parameters’ classes can be used. Class 1 are the best, having a slope less than 1/3 (19°), natural vegetation less than 10 cm high, unshaded and at least 100 m from buildings or bodies of water. Class 2 are next best, having a slope less than 1/3 (19°), natural vegetation less than 10 cm high, unshaded and at least 30 m from buildings or bodies of water. Class 3 (additional estimated uncertainty added by siting up to 1 °C) - natural vegetation less than 25 cm high, unshaded and at least 10 m from buildings or bodies of water. Class 4 (additional estimated uncertainty added by siting up to 2 °C) - Close artificial heat sources and reflective surfaces (buildings, concrete surfaces, car parks etc.) or expanse of water (unless significant of the region, occupying: Less than 50% of the surface within a circular area of 10 m around the screen; o Less than 30% of the surface within a circular area of 3 m around the screen. Class 5 (additional estimated uncertainty added by siting up to 5 °C) are the sites not in Class 1 to 4 above. In order to document the performance characteristics of the various surface observing networks used, Météo-France defined another classification, called "maintained performance classification", including the uncertainty of the instrument and the periodicity and the procedures of preventive maintenance and calibration. I only mention it because of the diagram below, in which Leroy shows the classification of the Radome network, which is the the main surface-observing network of Météo-France. According to Leroy (2010), 85% of the weather stations in that network are rated as Class 1 to 3, 5% as Class 4 and 1% as Class 5 - using the temperature and humidity classification. As you can see from the above diagram, Leroy (2010) grouped his Classes 1 to 5 differently to the Watts poster. Leroy grouped Classes 1, 2 and 3 together, and Classes 4 and 5 separately. The authors of the poster grouped the classifications differently. Instead of reporting Classes 1 to 3 together, Anthony's team grouped the 410 stations with Classes 1 and 2 together, and Classes 3 to 5 together. ...When the journal article publishes, we’ll make all of the data, code, and methods available so that the study is entirely replicable. We feel this is very important, even if it allows unscrupulous types to launch “creative” attacks via journal publications, blog posts, and comments. When the data and paper is available, we’ll welcome real and well-founded criticism. This is a technical thread, so those who simply want to scream vitriol about deniers, Koch Brothers, and Exxon aren’t welcome here. Same for people that just want to hurl accusations without backing them up (especially those using fake names/emails, we have a few). Moderators should use pro-active discretion to weed out such detritus. Genuine comments and/or questions are welcome. Here are some comments from the WUWT detritus. The kind that is welcomed at WUWT. ntesdorf might be surprised to learn that the data Anthony's dogsbodies analysed is a subset of the same data analysed by the NOAA. This is a colossal effort and achievement by Anthony Watts and deserves the widest study and acknowledgement. I hope that there are no mis-guided efforts to block its publication. The benefits of this study are self-evident. Reliable data is the basis of all science, and reliable data has been missing from the Climate debate for a long while. Sou (as in Soooooie!) over at Snot Plopper been trying to debunk this paper since she saw Anthony’s tweet in October! I’m so excited to read it Anthony! Jeff Id congratulates Anthony for his effort in getting Evan Jones, and John Nielsen-Gammon and his students, to pull together the analysis and the poster. You should be very proud of the time and effort put into this. My biggest congratulations. Very impressive sir! Also to the coauthors and those who put so much time into supporting this effort. Nice work, Anthony. You set a standard to which others should attempt to emulate. If I read the numbers correctly, it looks as if we should take any warming trend we see from adjusted temperature record trends and multiply it by ~2/3. e.g. for HadCrut, GISS, BEST, etc. The remainder were much the same. Heartfelt gratitude and congratulations all around. I didn't see anyone asking any of the questions I've posed. There weren't too many commenters who showed much sign of reading the poster. After posting, I found that Victor Venema has already written an article about the work, which you can read on his blog. The two main discussions with Evan Jones in April 2014 at HotWhopper are here and here. Quite right Sou. From the 80ies to the first 2/3 of the 90ies the temperature dropped. If their hypothesis that bad siting exaggerates both warming and cooling the compliant stations should have been warmer during that period in the 90ies than the non-compliant. The opposite happened. The compliant got colder. And stayed that way from there. The difference between the series is a product of what happened during that period. Their compliant stations do not comply to their hypothesis. Victor Venema suggests that it could be errors/uncertainties in the temperatures in the early part of the period that are the cause of the apparent step change in Watts' "Class 1\2" category. Whatever - either the data are out of step from 1992 onwards, or out of step from 1979 to 1992-3 (or both but to a lesser extent). If the researchers hadn't aligned the different sets of data to a single year and instead had plotted anomalies from a baseline of, say, a thirty year average, this point would probably have become clearer to them. This paper appears to be a classic example of the Ikea effect. Once more a lightning response from Sou. Skill! I may be chair of the Task Team on Homogenization of the WMO, but far from an insider yet. Normally I had not been able to answer your question, but there is just someone from WMO around and he told me it is a WMO standard. It may not be final, they describe it as a living document. It is a standard of the CIMO, which are the meteorologists with an operational responsibility for the meteorological networks. They are not the climatologists. Thanks, Victor. Seeing that Watts et al didn't use the full criteria in the classification anyway (such as shading or slope or vegetation), it's probably not all that important. I see that Judith Curry has gushed over the press release. It's not clear to me whether she bothered to read the poster. She just uncritically endorsed it, warts (unnoticed by her) and all. She's behaving less like a scientist as each week passes, if that's possible. Good to see there are a few people who want to wait for the data and the promised paper. I'm not convinced it will have sufficient new science to warrant publication. If they want to publish, they'll have to do more work on it, I'd say. It was a big job - for Evan Jones and maybe John Nielsen-Gammon in particular. It would be a shame if they wasted the effort by focusing on unsupportable claims. I also noticed that the "belief" of Anthony (that NOAA have fudged the data) is what a lot of deniers are drawn to. No evidence - just a "belief". Again, typical of climate conspiracy nutters. No Steve McIntyre among the authors? No data to 2015? No baseline reference? No Poster Girl for the Wow!-Just-Wow! factor? ... Interesting. That's probably fortunate: ending with an El Nino year would skew things a bit. Having a rate of warming of 0.204C per decade is alarming enough. If a scientist came out with a number like that it would be marked by a 'claim' article and abuse from the baying mob. Of course ending with a strong la Nina year skews nothing at all! Starting at 1979--a weak el Nino year and ending with 2007 a strong la Nina year does what sort of "skewing"???!!! I'm sure this all is just a coincidence forced by the data, however. Why it has taken so long for Anthony's 'paper' is that it is difficult to cherry pick the stations and the time span. The junior woodchucks only covered the USA stations, so as any measure of anything it is totally meaningless globally. Even then the trend was only suppressed not eliminated. 2008 seems to be a dangerous year to be using with a limited number of stations. If their method produces biases towards data from Alaska they could even show global cooling. Millicent, similarly if the the collection of stations they came up with had the Southeastern US overrepresented that would impart a cooling bias on their dataset. But of course, they aren't telling us yet. I see that Patrick Michaels did a presentation or paper at AGU that Curry's site if promoting. Any thoughts? I got 3/4 the way through the article and still couldn't find one accurate statement. It didn't seem to contain anything new from the point of view of denial or from the perspective of science. It's just a piece of puffery from a despondent duo at one of the many denier organisations AKA the CATO Institute. My reading is that Pat'n Chip have given up trying. Given the history of how we might say less than honest or credible claims from at least Michaels (I don't recall seeing too much about Knappenberger), and the regular questionable use of data and the research of others by "skeptics", I approached this piece with a very high level of skepticism, but I didn't know if someone highly knowledgeable about the claims being made had looked at the post and given any detailed thoughts about what was presented there. Sou - just a note, "exaggeration of a cooling trend" by the full dataset would bring the two lines closer together in the last decade of their analysis, which does seem to be what happens. It doesn't look like there's any sort of consistent scaling factor though, the recent effect seems very small. I am guessing Victor's hypothesis of unrecorded station moves is the main explanation. poor geographic distribution could also be a factor - is 90 locations representative of the whole country? If there were more good locations in southern states (say) than up north where the trend has been higher, would that explain it? You're right, Arthur. However I've just measured the difference on the chart (looking closely). The difference between Class 1\2 (blue) and Class 2\3\4 (orange) is less in 2006 and 2007 than in 2008, and those were two of the warmest years in the record (2008 is just one year in any case). In fact, the difference between those two in 1998 (the hottest year before 2008) is the same as it was for 2008. It does appear to me that something happened around 1992-93 to shift the Class 1/2 data down relative to the other two. There's not a lot of change in the gap/difference between them in any year afterwards. You need to copy the chart and use a measure to see this. Of course, the chart could be wrong. We'd need to see the data itself to see what the reported differences really are. The deployment of ASOS units in the US began in 1991 - could that have any bearing? Actually, I think it was this one, but the previous is probably relevant also. Sou - both Hubbard papers ("The Effectiveness of the ASOS, MMTS, Gill, and CRS Air Temperature Radiation Shields" and " Air Temperature Comparison between the MMTS and the USCRN Temperature Systems") were discussed with Evan Jones in The fruitarians are lazy thread at Stoat's back in Sept of 2014. Evan said at the time (in reference to the physical mechanism causing the results), "Our physicist co-author thinks this factor is easy to nail and he does know about the Hubbard paper." Thanks, Kevin. So they "know about" the papers but ignore them? This raises even more questions. Who is their "physicist co-author"? A silent partner? When and how are they going to "nail" this factor? But, yeah, it could be more complicated than that. Choosing to arbitrarily align the datasets at 1979 might be a factor too. As Sou (and Mosher) say, without the data, it's pretty much a crapshoot. To me it's really a matter of Occam's Razor: We have a statistical result that requires a physical explanation that exaggerates both highs and lows. There is *already* a known component of the measurement system that does exactly that - the Dale/Vishay 1140 thermistor used in MMTS stations. The systemic bias from the MMTS is corrected by the PHA process (supposedly). But we also know that this correction works *in aggregate* over all the COOP stations. Occam's Razor tells me that the MMTS systemic bias is *still* evident in the results of Watts et al. It may be that they've scored an 'own goal' by showing that a *larger* MMTS bias adjustment needs to be made to completely remove the effects of the physical response curve of the Dale/Vishay thermistor. And that would seem to be where the cooling bias is coming from. Show us yer data, Wattsy. I asked at WUWT and Evsan said there are 92 Class 1/2 stations used to represent the entire US. There are no error bars or uncertainties listed but I'd guess that maybe the possible error is larger with 92 samples than the full 1218. As mentioned it is not clear what the geographic or topographic distribution is. They use grinding to calculate to calculate the regional anomalies, and then just average the nine regions to get the national value. I saw that, David - about the number of stations. I've amended the text somewhere above to show it. Evan wasn't that far off in April 2014, when he estimated one in five. From what you say, the way they combined their data wouldn't be comparable to that of NOAA if they didn't use gridding over the whole and just averaged the regional. Better people than me will no doubt look at this if/when there is any data provided. Based on pure unbiased, non-autocorrelated sampling distribution considerations, the expected standard error from 92 versus 1218 stations would be about 3.6 times greater. Strong, positive autocorrelation among the various stations might well reduce this value. A bunch of us made code freely available so that Evan could use a standard gridding approach. I don't know why they insist on that choice of doing averages. heck skeptic JeffId and RomanM published a method. Willis could have done the averaging using skeptics code. I will be back to address comments. Back in September of last year at Stoat's, several of us told Evan that without a physical mechanism all he had were some interesting results. Evan replied back then: "Our physicist co-author thinks this factor is easy to nail ..."
Apparently nailing the physical mechanism wasn't quite as easy as that co-author physicist thought. BTW, I didn't even notice any physicists included among the co-authors. Cristy w/ a degree in Atmospheric Sciences, most likely, I'd guess. you missed a trick in the headline here. Why did Watts align the data at 1979, or anywhere for that matter? It would be much more useful to publish annual differences between Compliant and Non-Compliant relative to a baseline for each. Then one could compare the rate of change between the two data sets over whatever period they wanted.
" we baselined it to 1979. If you don’t baseline it, the trends form an X rather than a <. ~ Evan"
This implies that if all were graphed agains the same baseline, that the 1979 set of 92 stations would have a higher anomaly than the USHCN, and then that difference would diminish over the 30 year period as it rose more slowly, ending up below the USHCN level in 2008. Also just because a subset of stations has a different trend does not prove that the overall trend is incorrect. There can be various reasons for the difference. Anthony Watts says the U.S. is warming at 0.2 degrees C per decade. If Watts can get all his followers to believe that the world is warming at 2/3rds the rate most scientists calculate, that would be a giant step forward. Anthony Watts says raw US data has a cooling bias. In the "raw" data, the "unperturbed" subset has a trend in the mean temperature of 0.204°C per decade; see table below. In the "perturbed" subset the trend is only 0.126°C per decade. That is a whooping difference of 0.2°C over this period. This confirms that in the USA the inhomogeneities ("perturbations") cause a cooling bias. But what if the metadata is wrong? That's exactly why NOAA, NASA, and BEST don't do it that way: they look at the actual data itself, compared to nearby stations, to determine when instrumentation changes took place. So it seems to me that the most likely situation here is that the group 1&2 stations include a handful with incomplete metadata, that is caught and properly adjusted by proximate-station algorithms. We can't know that unless Watts releases his data, but if this is indeed the cause of the divergence then he won't get past competent peer-review and he may never release his data. This would probably suit Watts et al. just fine of course. Another urban legend for the conspiracy ideation crowd. The only possible effect of significant heat sinks near recording stations would be to reduce the diurnal temperature range (DTR), the distance between min and max daily temps. They would have no effect _whatsoever_ upon trends. Seasonal variation is far larger than yearly climate change, meaning the time constant for such heat sinks is far less than a year - which is only reasonable given _basic_ physics. UHI influence on temperature trends is a dead horse. Unfortunately, that doesn't seem to stop Watts and Evans from beating the bloody (coagulated?) corpse. KR - I agree that "heat-sink" in this context is merely a euphemism for: We don't understand the physics. I've said as much in the comment section at WUWT. Give some credit to Evan Jones, though. Read through the comments (search the page for "evanmjones") and you'll find Evan consistently shooting down the usual suspects with their usual accusations of fraud/incompetence/conspiracy etc. He's also been shooting down the UHI meme at the same time. Rather than just presenting trends, you can compare difference in trends between site quality categories with a simple linear regression with interaction terms. This will enable you to identify whether tehre is a significant difference in trend and by how much, and also to see if there is a difference in level. It's trivially obvious from the charts that there is no difference in trend, but you can test this statistically using this simple, well-understood procedure. Then you can publish a definitive paper putting to bed the idea that UHI has any effect on temperature trends. As a service to the HotWhopper community - I present the digitised CAT 1,2 (0.204 degree per decade trend) and NOAA (0.323 degree per decade trend) data as derived from the plot above. Note that units are degrees C per decade. My British standard calibrated eyeball, together with a little help from excel, determined average differences of 0.00 for 1979-83, -0.14 for 1984-91, and -0.28 for 1992-08. Some-one with skill is likely to do a professional break-point analysis of the data. That is funny. I first thought you had made and error, but the unit of the y-axis of the Watts et al graph really is 0.01*°C / decade. Do they mean 0.001 °C? °C per decade is the unit of the trend. To compute a trend you need to define the period. Trough these trend values, they draw a trend. ??? "It's trivially obvious from the charts that there is no difference in trend, but you can test this statistically using this simple, well-understood procedure." Yes, doing just that with George Bailey's approximation of the data above, a simple linear regression with interaction (slope and intercept dummy variables) yields p=.908 for the difference in intercepts, and p=.355 for the difference in slopes. That is, neither difference is distinguishable from noise. However, if you *require* both lines to have the same origin at 1979, then the slopes are different (p=.047). Of course that result is an artifact. That is a nice way of analysing the data. However, both curves should estimate the same quantity (if Watts et al did their averaging right) and you can thus also test the slope of the difference time series and whether this is different from zero. I did not compute a formal test, but by eye you can see that the trend of the difference time series is statistically significant. Not sure if a model with a change in the trend is justified, more likely the simpler model of just a linear trend would be more parsimonious, but maybe we could say that there is a "hiatus" since 1995, a "hiatus" in the meaning of the climate "debate": a non-significant change in trend that makes the trend since 1995 basically zero. I kind of wonder how many variations on these methods they had to try before they got the results the desired. I bet a lot. It reminds me of the mathturbation in Gerlich and Tscheuschner. I think Gerlich and Tscheuschner is somewhat above and beyond even this. Their, uh, idiosyncracies extended far beyond mere mathturbation and deep into the realm of "not-even-wrong" conceptual confusion. It requires a staggering level of basic misunderstanding to reach the conclusion that the greenhouse effect cannot exist because it violates the Second Law of Thermodynamics! OT Sou: Judicial watch in the USA is suing NOAA because they didn't get what they wanted in an FOIA. I'm not familiar with Tom Fitton, but it might prime material for a post. I'm really struggling to get on the same wavelength as Watts - I'm not sure what that says about my skill set. Anyway, is it correct to re-interpret the narrative as saying that the warmer the temperature (trend) the greater the anomaly between Watts and NOAA should be? Testing the second half of the data set, or the data set from 1999 onwards, shows little to no correlation between the NOAA (or Watts) temperatures and the actual anomaly. Maybe I've had a busy week (haven't we all) and I've totally missed the point. Wise counsel is sought! Considering the data only go to 2008, I feel it should be asked: have they been working on this for six years? Three years of work before their initial lost at WUWT only to find that they had done it all wrong, then another three to get to where they are now - a poster session and a paper that may or may not be accepted to a journal? I cant imagine what happens if another fatal flaw is found that undermines their conclusions. And let's be honest, it's far more likely that they don't know what they are doing that it is that NOAA doesn't. Cabc - if you read through all the old threads at various sites that followed the 2012 'Breaking News' and subsequent abortion, you'll find Evan Jones somewhere remarking upon 2010 as the genesis. So, 2 years to put the original together and 3 1/2 more since then.